For those of you who haven’t been introduced to our favourite addition to the clinic, meet our latest skin care regime. 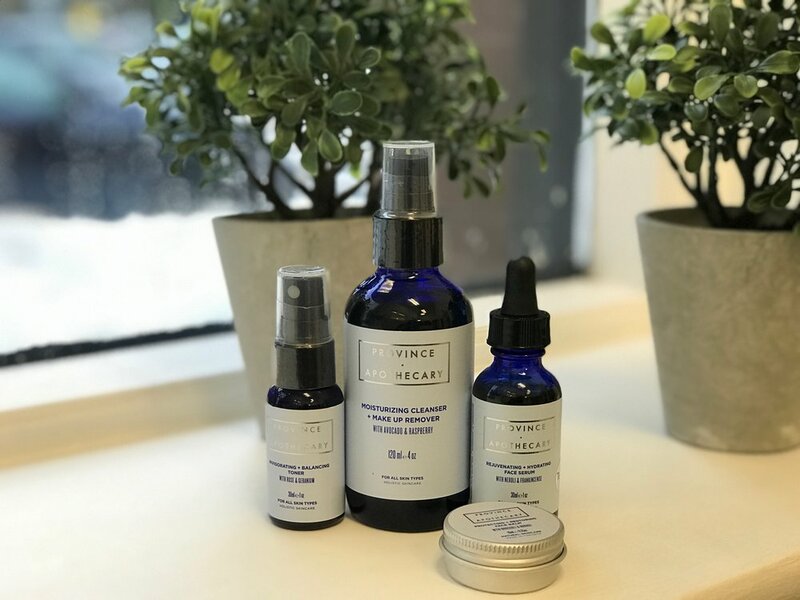 Our ND’s Jodie and Céline, spend a lot of time discussing skin regimes for the best skin results, all the while, maintaining our belief in natural products. We both settled on a Canadian company we cannot get enough of. Their oil based makeup removing cleanser and daily dry brush have changed our skin care game big time! Come in and chat with one of us about your skin type and the appropriate regime for you. We feel confident that these products will keep you glowing. 1. Wetting face with warm water. 2. Gently massage two pumps of our Moisturizing Cleanser + Make Remover on your face in circular motion. 3. Remove with warm damp cloth. 5. Spritz our Invigorating + Balance Toner on dry face. 6. Combine 6-8 drops of our Clear Advanced Face Serum with equal parts water in the palm of your hand. Massage into skin for 10-20 seconds. 7. Apply a thin layer of Nourishing + Revitalizing Moisturizer to face and neck in upward, circular motions. 8. As needed: Shake our Clear Skin Advanced Treatment oil before use. Apply once a day only. Place one drop on red areas. Wait 2-5 mins for it to absorb. 5. Spritz on dry face our Invigorating + Balance Toner. 6. Place 6-12 drops of our Rejuvenating + Hydration Face Serum in your palm and add equal parts water; mix together with finger tips. Apply to face and neck in upward, circular motions. Massage the serum into your skin for 10-20 seconds, to ensure deep absorption. Wait 5-10 minutes before applying moisturizer and makeup. 7. Use daily as needed. Warm up a small amount of our Protecting + Restoring Face Balm in palm. Apply a thin layer of balm to face and neck in upward, circular motions. 2. Gently massage two to three pumps of our Moisturizing Cleanser + Make Remover on your face. 4. Apply our Clear Skin Advanced Face serum after cleansing, while skin is still damp. Combine 6-8 drops of serum with equal parts water or toner in the palm of your hand. Massage into skin for 10-20 seconds. 5. Shake Clear Skin Advanced spot treatment before use. Apply once a day only. Place one drop on red areas. Wait 2-5 mins for to absorb. 5. Follow our Dry Brush routine. 6. Spritz on dry face our Invigorating + Balance Toner.